December 2019 will bring with it the last solar eclipse of the year (26/12), as well as Jupiter’s entry into Capricorn (02/12), the start of Chiron’s direct phase in Aries (12/12) and the Sun’s entry into Capricorn (22/12). What does this mean in terms of the astrological transits of December? The annular eclipse of the Sun in Capricorn will expose the authentic aspirations of the person and will highlight the importance of being able to count on talents and abilities that differentiate him from the rest. The solar event will be aligned with the energy of Jupiter in Capricorn, which drives the search for success, overcoming the lack of confidence (fear of facing hierarchies, processes and consolidated traditions). On the other hand, the beginning of Chiron’s direct phase indicates that now, with the knowledge of the ego traps that prevented the expression of your essence, you can take a decisive step on the path towards evolution. Finally, the entry of the Sun into Capricorn points to the rediscovery of personal ambition, and the design of the structure that will lay the foundation for your expansion, in every sense. 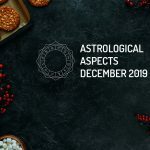 Here are some of the planetary events that will affect the astrological transits of December 2019. Ambition. Determination. Responsibility. Concentration. Imposition of overcoming self-imposed blockades, which deny the chances of success. While the road will not be easy, prudence will ensure a steady progress and realistic goals. (Watch out: don’t think you’re always right). Interest in new projects is awakened. In spite of having a better knowledge of one’s own identity, it is possible to make mistakes such as confusing what you do with what you are or going back to the old social masks. Importantly, cultivate perseverance in what you undertake, during this period of the year. Emotional freedom. Feelings subordinated to the rational aspect of personality. Fear of losing autonomy, if you agree to formalize commitments. Enjoy meetings with friends, and other social activities. Excellent transit to update profile on social networks. Practicality. Tradition. Obedience. The need to maintain control at all costs. While the Sun in Capricorn, during December 2019, is a position that encourages professional initiatives, it also favors autocratic behaviors, which can earn you powerful enemies. With the solar eclipse in Capricorn, we reflect on the patterns that hinder overcoming, the concept of authority, and the link to life purpose (do you really do what you are passionate about?). These considerations can lead to an unexpected change of professional course, or to the acceptance of the current position from a different, more positive and proactive perspective. Recognition of your environment will play a key role in making a decision. It is advisable to establish new business alliances (or work teams), expand the network of contacts, and consult the various possibilities with a coach (mentor, advisor). Constructive communication. Practicality. Discipline. Realism. Mercury in Capricorn can denote a certain rigidity in opinions (it is difficult to change your mind), and a tendency to calculate the benefit that will be obtained in each situation. Avoid using information as a weapon to get what you want. The contact with nature and the commitment with the assumed tasks is retaken. Vesta direct in Taurus is a favorable stellar position to work on the healing of self-esteem or help others to have a better appreciation of themselves.